About a decade ago, I traveled to Nashville for my cousin Jonathan’s wedding and visited the Grand Ole Opry with my dad and older sister. The Grand Ole Opry Radio Show is a broadcast frozen forever in time, a throwback to an old, weird, rapidly vanishing America. The performers represented the ghosts of Nashville past. There was Little Jimmy Dickens hooting and hollering away (confession: I don’t quite remember if Little Jimmy Dickens was, in fact, hooting and hollering away, but I’m going to assume he was), but more important, for the purposes of this piece, Porter Wagoner loomed magnificently over the proceedings like Gulliver among the Lilliputians. He looked resplendent in a snow-white Nudie suit festooned with his signature rhinestone-encrusted wagon wheels and his towering blonde-white hair done up in an epic pompadour. Few hillbilly peacocks were more famous, or infamous, for their outlandish sartorial stylings than Wagoner: His wagon-encrusted Nudie suits were as much a part of his image as his duet partner Dolly Parton’s magnificent cleavage was to hers. Wagoner represented a comically over-the-top burlesque of flashy masculinity, just as Parton is a larger-than-life caricature of down-home sexiness. In this and many other respects, Wagoner and Parton suited each other until their charmed union blew up, country-style! Ah, but back to the Grand Ole Opry: At what I am going to naively imagine was the climax of the show, Wagoner strolled into the front row of the auditorium and waded into a sea of wheelchairs to shake my father’s hand. It was a simple gesture, yet it instantly catapulted Wagoner into Rabin family lore. He was more than just a man who helped make television safe for country music and arguably the most important figure in Dolly Parton’s career; he was the man who shook my dad’s hand. All it took was two seconds, some eye contact, and a handshake to create a lasting memory. That moment of literal connection between an aging country legend and my disabled father said a lot about Wagoner’s appeal: Wagoner, who died rich and respected at 80 in 2007, was a consummate showman with the common touch. He distinguished himself as a singer, songwriter, bandleader, and musician but he was, above all else, an entertainer eager to use whatever means were at his disposal to sell a lyric, a song, or the Black Draught Laxative he was constantly pitching on his eponymous television program. Considering Wagoner’s fabled gregariousness, it’s hard to believe he was so self-conscious about a botched dental surgery early in his career that he would try to cover his mouth whenever he sang until he had the botched surgery fixed. A product of the hardscrabble Ozarks, Wagoner rose to prominence performing as a performer on television’s Ozark Jubilee, which broadcast from Wagoner’s home base in Springfield, Missouri. But his career as a recording artist didn’t take off until he recorded “A Satisfied Mind,” a breakout hit that would become his signature song and provide the title of a Wagoner biography written by Steve Eng. “A Satisfied Mind” is a spectacularly strange song and an unlikely hit. It opens with a cappella harmonizing between Wagoner and his back-up singers before segueing into a minimalist dirge about the spiritual emptiness of life with material riches away from the profound satisfaction of living in accordance with God’s laws. Wagoner sings slowly and distinctively, teasing out extra syllables from the lyrics as he rings out every last ounce of drama. Like Hank Williams before him, Wagoner was a moralist. Even his non-gospel albums have a fire-and-brimstone quality as the superstar warned listeners in song after song about the wages of sin and the rewards of virtue. Also like Williams in his “Luke The Drifter” persona—a formative early influence—Wagoner wasn’t at all shy about reciting portions of songs, or entire songs, to highlight as clearly and unmistakably as possible the most dramatic and meaningful passages. Recitals like Wagoner’s “Wino” belong to a lost era of country music, a time when the distinction between a hillbilly singer and a traveling preacher were slippery at best. The song begins with a flurry of weirdly comic sound effects, notably the stumbling pitter-pat of drunken feet and the crashing of bottles, before an upright bass begins plucking a jazzy shuffle. Wagoner begins piously reciting the sad tale of a man who may once have had dreams, plans, and a family but whose compulsions and additions have reduced him to an almost sub-human level. Wagoner’s tone invites both pity and disgust. The wino is a pitiable creature, to be sure, but he’s never less than human. Time has imbued many of Wagoner’s recordings with the distinct scent of kitsch, though I imagine they were pretty campy even at the time: It’s hard to listen to the tellingly titled “George Leroy Chickashea,” with its “ooga-chaka” faux-Native American grunts, and not feel a shiver of embarrassment for Wagoner as he shares the tale of a cursed part-white, part-black, and part-Native American man filled with rage toward a world that despises him. Wagoner’s songs tended toward the morbid and gothic. He was a whiz at murder ballads and singing from the perspective of the mentally ill. On “The First Mrs. Jones,” Wagoner dramatically inhabits the character of a deranged wife-killer who regales an unidentified listener with the sad tale of how his first wife, the eponymous woman, broke his heart by leaving him. In a drunken, despondent state, he searches the country for her before finally finding and killing her. At the end of the song, Wagoner twists the knife: “Did my little story scare you / oh I can see cause I’m so near you / little beads of perspiration dot your clothes / aren’t you sorry now that you left me / after all, you are the Second Mrs. Jones.” (Cue dramatic music.) It’s funny, because he’s totally going to murder his second wife. “The First Mrs. Jones” is intentionally funny, in a sick-joke kind of way; “The Rubber Room,” on the other hand, offers laughs of the unintentional variety. It’s the sonic equivalent of The Snake Pit: a cartoon take on insanity and mental hospitals. As someone who has spent time in the padded room of a mental hospital (I plan to begin every sentence that way from now on), I can vouch that it’s a little on the melodramatic side. Then again, what in Wagoner’s oeuvre isn’t? “The Carroll County Accident,” arguably Wagoner’s best known and loved story song, spins a pulpy tale of the titular car wreck, which killed Walter Browning, one of a small town’s most respected citizens and an ostensibly happily married man, but did not kill Mary Ellen Jones, the “well respected” driver of the car. As in “The First Mrs. Jones,” Wagoner saves the twist for the very end; the protagonist turns out to be—dramatic twist!—Browning’s young son, who finds a matchbox in Jones’ car containing the wedding ring that his dad hid from her. The boy disposes the ring, and with it, evidence of his father’s philandering. In the mid-’60s Wagoner, was on the lookout for a “girl singer” to replace his then-current duet partner Norma Jean. The woman he found became such a huge star that she more or less killed the very concept of a “girl singer”; after Dolly Parton’s rise to glory, female vocalists were no longer looked upon as mere foils for men; they could be superstars in their own right. No one was more popular or savvy about managing her career, and especially her finances, than Parton. Parton immediately invigorated Wagoner’s sound. The chemistry between the two on duets like “The Last Thing On My Mind” was nothing short of electric. The pop icon’s friskiness helped leaven Wagoner’s tendency toward solemnity. Parton’s pure, trilling voice, with its alternating currents of quivering vulnerability, cheeky bravado, and gentle humor, perfectly complemented Wagoner’s folksy, conversational delivery. The two proved greater than the sum of their impressive parts. In Parton, Wagoner found someone greater and trickier than a creative equal; he found a talent whose gifts, appeal, and popularity would someday outshine his own. When Parton met Wagoner, he was a 40-year-old legend she grew up watching on TV and she was barely out of her teens. But by the time their personal and professional partnership ended in acrimony, Parton had usurped him in every conceivable way. The power dynamic of their relationship was reversed; Parton stopped being Wagoner’s girl singer and Wagoner became the man who gave Parton her big break. When I saw Wagoner at the Grand Ole Opry, he struck me as a human anachronism, a throwback to an older, cheesier yet charming Nashville. Now that I know just a little bit more about country, he seems more like a key transitional figure who helped take the genre from the spooky, stripped-down authenticity of Hank Williams to the flash, dazzle, and mainstream popularity of Dolly Parton. 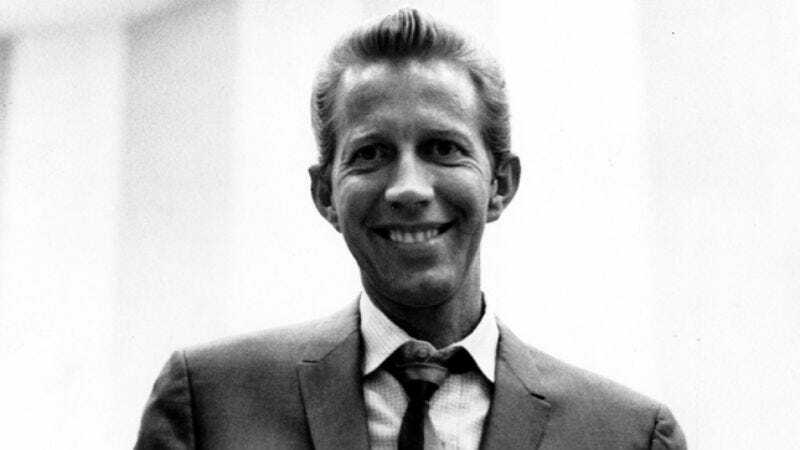 He helped take hillbilly music from the honky-tonk to the small screen. It must have wounded Wagoner’s pride to watch his protégé best him, but he could take comfort in knowing he’d made a permanent impact on country, as a writer, performer, TV personality, mentor, and businessman. And he could take comfort in the knowledge that all of Parton’s riches can’t compete with the more austere spiritual rewards of a satisfied mind.